Lions Fight Back, But County’s Eyes Stay On Mane Prize! 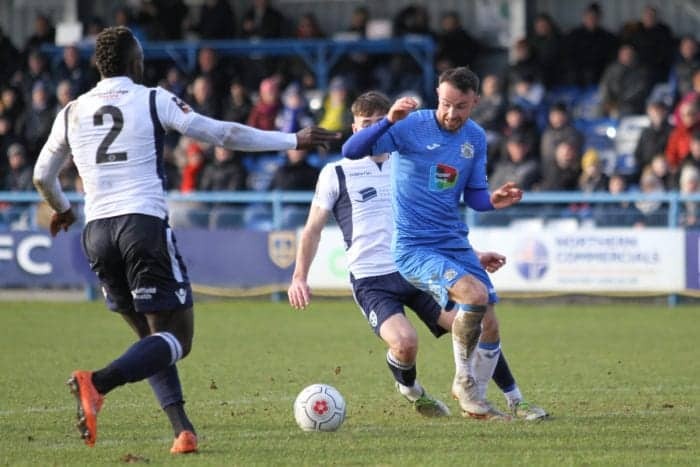 The Hatters earned their first-ever goal and point at Nethermoor against the ‘Lions’ of Guiseley – and, in doing so, inched to within three points of leaders Chorley who were beaten by Southport. 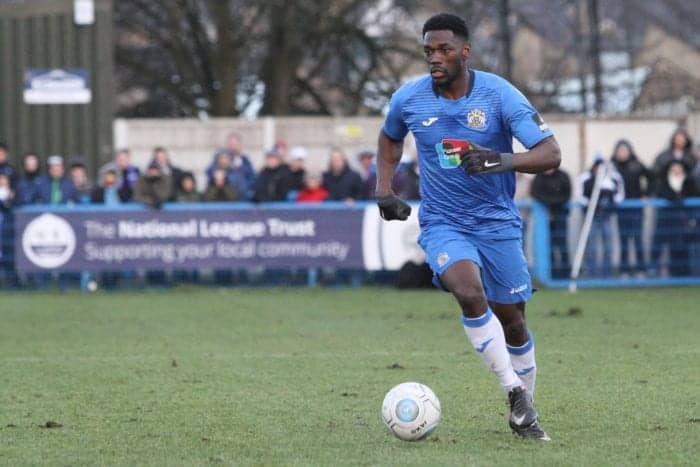 The gap at the top could have been narrowed even further, as County took the lead through Darren Stephenson just ahead of the break – although an archetypal ‘game of two halves’, that featured lively winds and a heavy pitch, saw the hosts equalise before the hour was up. The Hatters took to the field on a sunny West Yorkshire afternoon – but in the wake of heavy overnight rain – showing an unchanged 4-2-3-1 line-up from that which had started on the same side of the Pennines at Harrogate town in the FA Trophy seven days earlier, and included, in Frank Mulhern and acting captain Ash Palmer, two former Guiseley players from the previous season. Within two minutes of kick-off, both returning Lions had made an impression on proceedings, as Mulhern saw a shot from three yards out deflected beyond the left post, and Palmer went to ground under a challenge in the home area – only for play to be waved on by Referee Speedie. Up the other end, an ex-Hatter came close to opening the scoring – but fondly-remembered striker Kay Odejayi, who was played through on goal after six minutes, unleashed a shot that lacked pace and was comfortably gathered by Ben Hinchliffe. With 10 minutes played, Palmer had the ball in his previous club’s net after heading on Sam Walker’s wind-assisted free-kick – but the effort was ruled out for offside. The Hatters, with the breeze on their backs, proceeded to dominate in first-half possession – albeit without converting the chances they created. Matty Warburton skewed a shot wide of the right post, before Stephenson, from the left, had one deflected into the arms of Marcus Dewhurst. The Lions were presented with a better opportunity on the half-hour, when Hinchliffe uncharacteristically spilled Rowan Liburd’s cross from the right – but Palmer came to the rescue by deflecting Odejayi’s follow-up shot when the goal was at the former County player’s mercy. 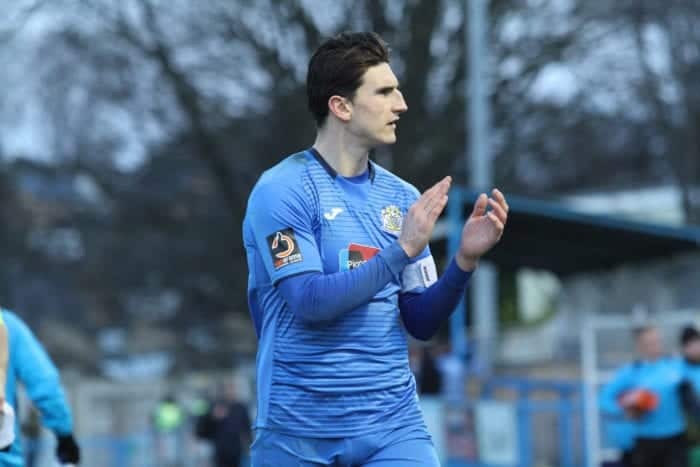 Warburton fired another attempt beyond the right upright, and Lewis Baines almost marked his first National League North appearance for County with a goal when he headed Walker’s chip at Dewhurst. But two minutes before the break, the Hatters finally made their first-half dominance tell. Moments after Will Hatfield had drilled wide of the left post, County took the ball up the home end – before Warburton’s shot took a deflection that Dewhurst could only parry to the feet of Stephenson, who made no mistake for his fifth goal of the campaign. HALF-TIME: Guiseley 0, County 1 (Stephenson, 43). The hosts, now with the wind behind them, sounded early second-half declarations of intent by forcing two corners. And, following a spell of pressure, they drew level within nine minutes. Cliff Moyo and young Sheffield United loanee George Cantrill exchanged passes on the right flank, before the latter cut in beyond Scott Duxbury and fired his first senior goal past Hinchliffe. Five minutes later, Guiseley came close to taking the lead when Niall Heaton headed a corner from the left against the crossbar. And the Hatters benefitted from a further slice of luck when Baines looked to have brought down Hatfield in the box – only for the home player to be shown a yellow card for apparent simulation. The Hatters, who withdrew their two top scorers Warburton and Mulhern, had to wait until the 83rd minute before fashioning a first post-interval attempt of note, but Sam Minihan’s low shot fizzed just wide of the right post. And in added time, Jordan Keane’s first-time volley flew over. 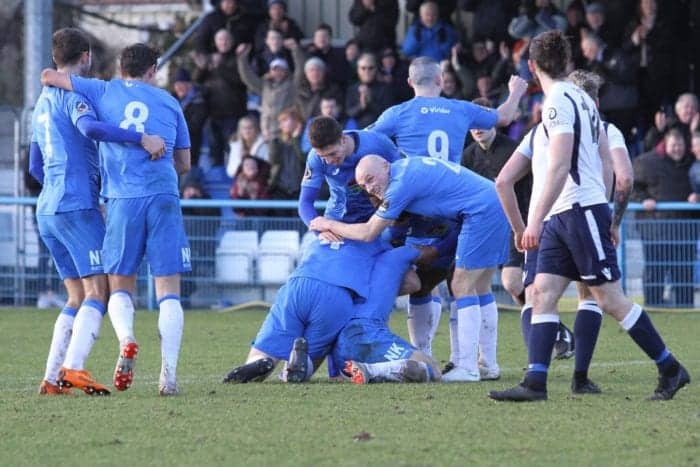 The draw – replicating the scoreline between the two sides at Edgeley Park in mid-August – brought to an end the Hatters’ 10-match winning run in all competitions, but leaves them unbeaten in 12 League fixtures. FULL-TIME: Guiseley 1 (Cantrill, 56), County 1 (Stephenson, 43). Team: Hinchliffe, Minihan, Duxbury, Keane, Palmer (Capt. ), Baines, Thomas, Walker (Kirby, 89), Mulhern (Osborne, 80), Warburton (Turnbull, 59), Stephenson.